Here's a story that might put the fear of God into some of you -- over in England, a 19 year old was recently banned from raving. Magistrates in the UK ruled that the teenager, who had been arrested for possessing a variety of intoxicating substances that his social betters disapproved of, would no longer be allowed to party on weekends. He could still go raving Monday through Thursday, but Friday, Saturday, and Sunday were out of bounds. While his friends were out partying, he'd be under curfew at home, forced to watch the BBC with his family, and maybe even eat dinner with them. Our story isn't all sorrow and tears though. Local ravers rallied to the poor boy's cause, and his county is now home to a variety of weekday raves. The magistrates, meanwhile, only placed the lad under curfew for a year. Once he's 20, he'll be free to drop ecstacy and dance to the beats being spun by his favorite Donk DJs at a legitimate, Friday night rave. The idea of drug users being banned from raving is pretty novel. 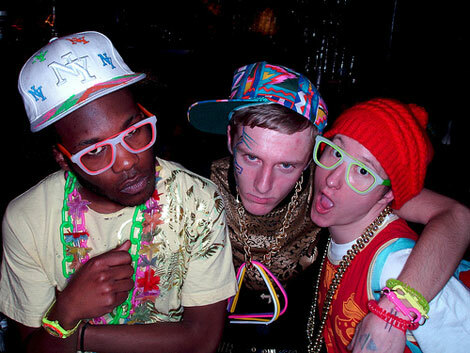 The UK is a pioneer when it comes to harassing ravers, though. Don't be surprised if they start exporting their anti-fun know-how to the rest of the world. One day in the not so distant future, judges in Canada might start handing out curfews to drug addled ravers, telling them that they can no longer go out dancing on weekends. When that happens, you'll know who to blame: The British.